There are around 7,500 km of coastal and river flood embankments in England and Wales. Effective performance of these embankments during extreme flood events is critical for the provision of sustainable flood risk management. Embankments can become less effective over a period of time. The tendency for the performance of earth embankments to deteriorate over time is of particular concern when considering the increasing loading that will continue to be placed on flood defences as a result of climate change and the increasing rate of occurrence of extreme events. It is the Environment Agency’s responsibility to ensure that flood embankments are designed and maintained to achieve optimum performance. 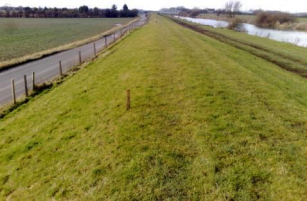 This project related to the effective maintenance of a section of the Dutch River Flood Defence System near Goole. The Dutch River is a re-engineered section of the River Don between the River Went and River Ouse. The Dutch River has a significant tidal influence. The flood embankments on the Dutch River essentially act as ‘low-level dam’ for short retention periods. For the majority of the time, the embankment is exposed to minimal or low hydraulic heads and remains largely unsaturated. However, during flood events and / or particularly high tides, the embankment needs to withstand a rapid rise in water level on the outward face, along with the corresponding changes to internal water pressure driven by the higher hydraulic gradients across the embankment. Seepage was occurring along an extended length of the embankment section requiring improvement. This seepage was clearly visible in a section supported by a retaining wall and in adjoining fields, where ponding was observed. Seepage through or under an embankment constitutes a failure of a flood embankment to perform its main function of water retention. However, especially in early stage failure, the volume of water lost is often relatively small and this seepage is considered acceptable. Envirotreat designed a mix which was installed by continuous flight auger [CFA].